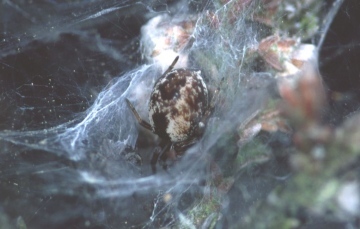 On 6th June 1999, I observed two males of the spider Dictyna arundinacea (Linnaeus, 1758) that separately seemed to be guarding egg sacs, normally the duty of the female. It is well known that some species in this genus are social, with males and females often living together within the security of the mesh web (Jackson, 1978). In order to investigate the extent of independent guarding behaviour of the male, I decided to monitor a small sample (n=12) of females with their egg sacs on a weekly basis from 10th June to 6th July. Unfortunately, the presence of a single male guarding was not observed again, so it may just have been that males were alone after a gregarious phase with a female and were not actually guarding at all. However, during this time, I did obtain other information about mating and egg sac placement and guarding in this species which may be of interest to readers of the Newsletter. In the laboratory, when a male was introduced to a female, he almost immediately made a very basic scaffold web which took only about three minutes to complete. This scaffold allowed him to approach the female from underneath and behind but, as a precursor to sperm induction, the male stroked the abdomen of the female with his first and second pairs of legs whilst still approaching from behind. Once positioned underneath, he wrapped his legs across the cephalothorax of the female. One palp was seen to be pumping continuously, but the use of alternating palps, as reported for D. uncinata by Bristowe (1958) was not observed. The male and female remained locked together for well over an hour. Afterwards, I placed the female outside on a dead honeysuckle stem on which she later produced one egg sac, suggesting that sperm induction and fertilisation had occurred. In natural field situations, most Dictyna webs can be found on the tips of dead vegetation in the field layer, commonly on St John's-wort (Hypericum spp.) or dock (Rumex spp. ), but in the population along a farm track in Shropshire (Nat. Grid Ref. SJ 712204) which I investigated, females had used nettle leaves as their oviposition site. Each site was marked so that egg sacs could be relocated accurately. Females produced an average of 2.5 egg sacs, with one producing the maximum of four. Eleven of the twelve individuals (92 per cent) positioned their egg sac on the upper side of the leaf about 0.5 m from the ground. All but one of the females were actively guarding their egg sacs at the beginning of the survey, but, within the first week, four deserted their egg-sacs even though the leaves were still in good condition. However, towards the end of the survey nettle leaf senescence had caused 75 per cent of the leaves on which egg sacs had been placed to fall untraceably to the ground. Only on one occasion was I successful in locating fallen leaves: here the female was found still loyally guarding her egg sac. First thoughts are that, because of their deciduous nature, nettles are not ideal host plants on which to place egg sacs. However, leaf senescence may increase the chances of hatching: as the leaves yellow, they curl over and protect the egg sacs. At the latter stages of senescence, leaves are rolled and tube-like, possibly providing a more stable microclimate. Thus enrolled, the egg sacs may be overlooked by oophagous predators and egg parasitoids, such as Gelis, may have to search a little harder. Finally, a few comments on D. arundinacea's distribution: Bristowe (1958) indicated that this species is widespread in the UK; however, at a local level in Shropshire, I found the spider's occurence to be patchy and rare. This effect does not seem to be habitat-limited, as nettles are very common in the vicinity. A search of four miles of hedgerow and field margin yielded only one other community and this was even smaller than the one I had chosen to observe. I am puzzled why this species is not more widespread in the area. Dictyna is around the critical mass of 2 mg which would allow a successful ballooning attempt (Greenstone et a/., 1987), but I am unaware of any ballooning records for this genus. Possibly there is no motivation to balloon, or perhaps the meteorological stimuli which initiate ballooning attempts (see Weyman, 1993) are less detectable by the spider when under its mesh web. Jackson, R. R. (1978) Comparative studies of Dictyna and Mallos (Araneae, Dictynidae): I, Social organisation and web characteristics. Revue arachnol. 1: 133-164. Greenstone. M. H.. Morgan, C. E.. Hultsch, A.-L., Farrow, R. A. & Dowse, J. E. (1987) Ballooning spiders in Missouri, USA, and New South Wales, Australia: Family and mass distributions. J. Arachnol. 15: 163-170. Weyman, G. S. (1993) A review of the possible causative factors and significance of ballooning in spiders. Ethol. Ecol. Evoi 5: 279-291.